Falling down over and over again is not unusual! It's actually very common among the greats. The only difference between you and those you look up to is that they have fallen down more times than you and have kept getting back up. Failure is nothing but feedback. Are you feeling as though you've fallen down so many times that you just don't think it's worth getting up once more? Listen, falling down doesn't make you great, getting back up does. The fact that you've fallen down simply means that you've taken the initiative to start the climb. That alone takes courage and most don't even make it that far. As I've gone through the trials and challenges I've faced in my life and business, I've found that every so called failure has literally been a stepping stone on my journey. What I mean by this is that everything I've learned from these experiences has given me skills and resources that play a part in my next step. Learn from it and it will scarcely bog you down. Every time something doesn't go your way, just think "What lesson is God trying to teach me here?" and "What can I change to make this better". As you approach every so called failure as a learning and growing opportunity, you will simply continue to blossom until one day you will have attracted everything your heart desires and more, because you paid the price! And know this... God is always true to His word and He says: "You reap what you sow". Whatever you put into something WILL come back to you in one way, shape, or form. How you go about doing it will also play a major role in what you attract. If you do what you do with a negative attitude, you will reap back negativity in your life. The rule doesn't only apply to action, it also applies to thought and attitude. Put out everything good and everything good will return. All things work out for the best, if you continue to do your best. Over the years, as I've built my relationship with God, He has revealed a few important things pertaining to my trials, challenges and my human potential. And I want to share those things with you. God will only ever do for you what you are not able to do yourself. - He won't do what you're not "willing" to do, but what you're not "able" to do. As we strive to be the best version of ourselves possible, every single thing (The good, the bad, and the ugly) that happens to us is the exact thing that needs to happen in your life to bring you up. - In every situation and I mean EVERY situation, there are one or more lessons to be learned. There are choices that you've made in the past that didn't set your course in the right direction to bring you upward, so God allows and controls these situations to push us back onto the right path. Sometimes you will even be guided in the wrong direction for a purpose in God. I feel that God will allow us to go down a wrong road so that when we do get on the right road, we can be dang sure that it is the right path. God places a fork in the road, one way is right and the other is wrong. You offer a silent prayer and he tells you to go down one of the two paths. Remember that there are only two roads, one is right and the other is wrong. As you stroll down the path, everything seems fine, it resembles the right path but then you come to a dead end. It was the wrong path! Now why would God send me down the wrong path? You can praise God knowing that everything has it's purpose, Thank Him for helping you learn something (that this is the wrong road and that the other one is absolutely 100% the right road), ask Him to guide your steps, get back safely to the fork in the road and now knowing of a surety that the next path you take is the right one. Sometimes, it is not necessary that God bring you down the wrong path. At times, you'll be so in tuned with His spirit that you will make the right choice consistently. And then there are times when we may be taking things too much into our own hands and not placing our trust in Him. Or He needs us to be a bit stronger for something He has planned in the future. To consistently and continually place our trust and faith in Him. To mold you into exactly what He needs, to fulfill His plan for you, with promises untold. As you ponder on these things, I would ask that you pray and ask God if what I said is true, and if you will ask God this question, in faith and expecting an answer, he will confirm it with a feeling of peace and tranquility to your soul. Will you do that my friend? How Do I Find & Overcome My Blocks To Rebuild My Life? Do you have a clear vision as to what you want your life to look like? If not, that's your first step. You can't rebuild something if you don't know what it looks like, right? If you do have a clear vision, do this: Write down your goal and all of the reasons you think you can't do it. (I know this seems counter-productive but bare with me). Then take every reason you've got and after stating your goal out loud, say all the reasons you can't do it out loud. Notice how you feel when you say it. You'll notice that every one of those reasons make you feel like crap. Those are called negative and/or limiting beliefs. And those are your blocks. Anytime you state a goal and follow it with but... pay attention to what you're telling yourself. All of those reasons you have for not going for it are your blocks. Now do the exact opposite of what you've just done. Take every reason you can't do it and write down the exact opposite of your reasons why not. For example: If your negative reasons sounded like this: I want to go back to school but... I don't have the money. I don't have the time. My mom always told me I'd never be smart enough to go to college etc.. This time around just say: I am going back to school because... I can find or make the extra money I need, I will make the time and what my mom said has nothing to do with me and my personal potential. She saw herself in me and I made a decision today to rise above these beliefs. Whether you truly believe these things right now or not, is not relevant. The important thing to realize in all of this is that, as long as you hold onto all those negative and/or limiting reasons why you cannot, you will never accomplish your goal. You will always do better and go further with the positive, empowering beliefs than with the negative ones. Negative beliefs hold you back while positive ones propel you forward! The only thing between you and what you want is your belief that you can't have or accomplish it. Once you eliminate those reasons why not, replace them with reason why you can, and then start taking action toward your goal, all of the barriers that are holding you back will start to move out of the way. 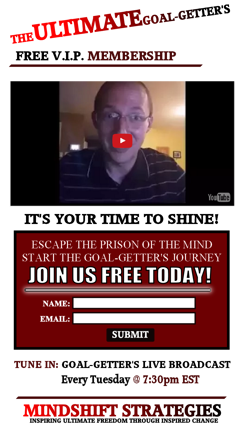 If you enjoyed this article you'll LOVE my Free 5 Step Goal Getting System! Remember to live life with passion, purpose and fulfillment everyday because life is too short to have it any other way. I know you've hit some walls in your life. Moments where you see something that needs to be done but oh man, you really don't want to do it. I cover this in my 5 Step Goal Getting System. I call it "Expanding Your Wall of Endurance". There are many times when we know we should do something because honestly we'd love the results but for some reason we just don't want to get off our butts. Think of the results you want and imagine how you will feel and what life will look like when you get it. Now, once you have that powerful image in mind, look back to what you're supposed to do right now to produce the result you're looking for and instead of thinking about getting it all done right now, just say to yourself "I'm just gonna do a little bit". Cause remember, you weren't going to do anything at all right? So a little is better than nothing and at this point it's not even to get the full result that you're looking for. We're going to expand your wall of endurance. 2. That really wasn't that bad, I think I'm gonna do some more. You looked at the dishes, had crazy gross feelings but decided to ignore those feelings and do just a little bit. You've acted in spite of your gross feelings! Now you realize it's possible to act regardless of how you feel. Everyday, you see the sink of dishes and think "I'm just gonna do a little bit". After a few days of doing this, it will start to get easier and easier to do. So on day 5 you decide, I'm gonna do just a bit more this time. So you do 12 dishes and your confidence is increasing. At this point, seeing the sink is no longer a wall. 7 dishes is also no longer a wall. 12 dishes is your new wall of endurance. You've expanding your wall dramatically! You keep expanding until your wall is no longer in existence and what used to be a wall has now become a habit. It's pretty much unconscious. As you approach your walls in this way, you will develop a resilience that will be habitual in nature and success will come to you much more easily. If this helped you in any way, go ahead and grab your free copy of my goal getting system below. Remember to live life with passion, purpose and fulfillment every day because life is too short to have it any other way. Think back for a moment to when you were a child and how easy it was to be happy. I'm talking about age 0-5. This was a time of discovery and excitement! Everything was up for grabs and all you needed was a bit of imagination and you could turn any event into an exciting adventure. Why do you think people always want to go back to that time in their lives? It's because that was a time where our imagination fueled our lives! So what happened? Where did all that fun and excitement go? Imagination is the only means by which we can effectively communicate with our higher self. About 97% of the population, especially in North America, have been brainwashed into thinking that using your imagination is a bad thing and even a waste of time! We've been programmed to "stop daydreaming", to "sit down", "be quite", "don't move", "don't question your authorities", etc etc. What this has done is take out the source of our happiness, fun and excitement! What a dull world this would be without imagination. And this, my friend, is why you are suffering with a life of dull, boring routines and a lack of passion and excitement. But... I can assure you that there are people in the world who have not lost their imagination, fun and excitement and it can be true for you as well. There are individuals who have either maintained or tapped into their imaginative state once again which has allowed them to create the life of their dreams. They are literally able to tap into a source of energy, through their imagination, that allows them to design the life they want and to create virtually anything their heart desires! These are people who have used their imagination, not only to obtain riches, but to revolutionize the way we live and enjoy entertainment. Now that you can see what the use of your imagination can produce on a grand scale, let's bring it back to the true purpose of this post. Imagination is the means by which we communicate with our higher self. The #1 reason imagination is so crucial and effective, is because it is the way by which we communicate with our high self or God or The Universe, whatever you wish to call it. There is a supernatural or spiritual side to us all and when we can tap into this spiritual or supernatural side, we become the master of our Universe. We gain more and more control as we are directed by the forces that be. I can just hear you now... Hold on there a sec Coach Luc, I'm not the religious type! lol Well, this can hardly be called religion. I'm taking about YOU and your potential. I'm talking about a force within yourself that is more powerful than you can even imagine. This is the power that the gentlemen above have used to revolutionize the entire world. On a smaller scale though, the power or energy of your imagination can help you in your day-to-day life and give you insight when you need it to pursue your passion. Bring Peace To Your Mind When You're Worried About Something... etc. The key to tapping into this creative source is to use it, and then trust it. When your creative or imaginative juices are flowing, you have to cherish it as though it's a message from a high source, because it it. You should write your thoughts down, ponder on it's message and then apply what you've learned. You must trust your instincts and learn to listen in silence to what is being said. Now I know that this message will go right over some of your heads and that's okay. My intention was not to make you a master at using your creative, imaginative source, but simply to introduce you to a concept that I have used and continue to try to master to create the life of my dreams. If you want to start using this source, start small and build your way up. For example: Let's say you are in a stressful situation and you are feeling frustrated, imagine for a moment that you are in a happy state of mind. Maybe you imagine being in a place that is peaceful and makes you feel happy. Maybe it's a memory of something in your life, like a time with your kids or friends. Anything at all will do as long as it brings up happy emotions. You will notice your mood change for a moment. Even if the change doesn't last, I just want you to see how powerful your imagination is. I want you to see that your imagination has the power to alter your emotions and if you've been through my 5 step formula, you know how important it is to alter your emotions to change your results in life. This is just one of the many uses for the imagination. I hope I was able to open your mind to a new concept and please do yourself a favor and actually apply this principle. If you would like to receive coaching on how to use your imaginative source at a higher potential, feel free to schedule a free starter session with us and we can decide together which of our coaching programs is a fit for you. If you are ready for change, we can help. If you've enjoyed this article, show some love by liking, tweeting, sharing and/or commenting below. Have an outstanding day my friend because there's no other way to truly live. You are the master of your Universe and there is a Genie who is ready to serve you at your will, at anytime. This Genie is called "The Law of Attraction". This Genie never questions your commands. You think it and the Genie immediately begins to leverage the Universe, through people, circumstances and events, to fulfill your wish. Whatever you spend time thinking on will immediately begin to attract itself to you in various forms. Some things are easily obtained, while others may take more time and energy. Often times the bigger things will require the Universe to bring you through a molding or transformational process to turn you into the type of person you must be to acquire what you need (resources, talents, skills and mindset) to attain your vision. But you must trust the Universe to serve you. As you make your request - by focusing your thoughts and desires on your vision, you will need to have faith in the Universe to deliver your desire right to your door. The number one reason you attract the opposite of what you want is because you're focusing on what you don't want and you don't believe you will get what you want. Make sure to place your focus on exactly what you want. Be as specific as you can! Also make sure to attach emotion to your vision (More About This Here). How bad do you want it? What will your life look like when you have it? and how will it make you feel? As you focus on specifically what you want, imagine what it would be like to have it, and attach strong emotions to the equation, the Universe will begin to attract that vision to you with intensity. You will start noticing things falling in place to make your vision a reality. Start today to make your request to the Universe, focus on it with intensity and emotion and keep that focus consistent. Then the universe will attract it to you with the same level of intensity that you placed on it. Comment, like and share if you've found value in this article. This doesn't have to be YOUR reality! I've created a 5 Step Goal Getting System and I'm going to give it to you absolutely FREE! The law of attraction is a widely known principle at this point due to the world famous movie The Secret. The law of attraction is a Universal principle that states that whatever you focus on and whatever you put out there into the world in form of thoughts, words and actions will come back to you in one way or another, whether it be good or bad. This principle has also been taught in the Bible in Galatians 6:7 where it states; ...for whatsoever a man soweth, that shall he also reap. Some people may question this theory and say it's simply hocus pocus. Think about this... Would you say that your thoughts and actions are mostly positive or negative? Think about it honestly. Now consider the state of your life - would you say it's generally positive or negative? Now consider the state of those you know are doing well in life - would you say they have a positive or negative attitude toward life? Now you may say that the reason they're positive is because their lives are going good, but I can assure you that it's the other way around. Their lives are going well because they have adjusted their attitudes toward life and have focused their energy on things that were positive. Consider this... Have you ever found yourself in a situation where you've told yourself you wanted a certain type of vehicle and all of a sudden you see those vehicles EVERYWHERE when just prior, you hardly ever noticed them? This is how the law of attraction works. It's not that they weren't there in the first place but that your focus wasn't there. As soon as you began focusing on that vehicle, it made itself present in your life. You are now opened to view it. Here's a fun little exercise I do with my clients and friends to illustrate this point. Example: I have a Sony Vaio Duo 11 laptop-tablet hybrid and I am enjoying every minute of it. Simply choose what you want and write it down on your sticky note. This would be worth going out and buying a new sticky note pad. Once you've written it down, post it somewhere you will be able to see it numerous times daily. If you need to, write it down on multiple sticky notes and post them throughout your house. Make sure to read it everyday, even multiple times daily, and work on trying to believe you already have it in your possession. Keep doing this for 90 days and see what happens. I can bet you'll have the thing you wanted or at the least a form of it and will be enjoying every minute of it. Try it out! What have you got to lose?